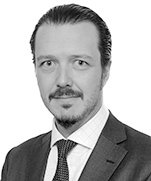 Frederico Buosi is one of Vella Pugliese Buosi e Guidoni Advogados founding partners, managing partner of the firm, co-head of the Corporate and Mergers and Acquisitions practice and head of the TMT and Intellectual Property practices. Frederico’s international experience includes working as foreign associate in the New York office of Allen & Overy. With more than 20 years of experience, his practice focuses in corporate, mergers and acquisitions, private equity and venture capital, project finance, capital markets, technology and outsourcing transactions. Frederico has substantial experience in complex commercial transactions around the world for companies in a wide range of industries, particularly in communications, financial institutions, private equity, telecommunications and technology industries. Frederico is recognized as one of the leading corporate and TMT lawyers in Brazil by Chambers Latin America, Chambers Global, Legal 500 and Latin Lawyer. Clients state that “He is one of the best for his ability to take care of very complex M&A deals” (Chambers Latin America). “His ability to find creative solutions to his clients' problems” (Chambers Global). Visiting Scholar of post-graduate course in Corporate; Law at Universidade de Brasília – UnB/DF, 2010 – 2011. University of Chicago, 2002, LL.M.